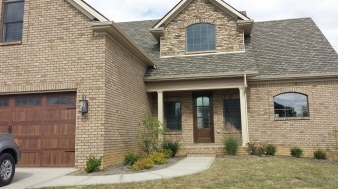 Description: Come home to this beautiful custom built home in tuscany subdivision! This home features an open floor plan and various upgrades like custom built-in cabinetry, haiku home fans and lighting fixtures throughout, elegant brizo faucets and fixtures, an efficient state of the art trane hvac system, and beautiful shaw flooring with continuous hardwood throughout the first floor. The gourmet kitchen boasts a beautiful large marble island. Spacious 2 story family room. The 1st floor master suite has a lovely tray ceiling, dual walk-in closets, and a spacious bath with shower and jetted tub. The exterior features all brick with stone accents. The home has approximately 2,900 sq ft of finished living space, 4 bedrooms, 2.5 baths and approximately 1800 sq ft of unfinished walk-out basement. A bonus room above the 2 car garage features a wet bar with wine cooler. Data believed correct but not guaranteed. Buyer to verify data prior to offer. Agents read agent remarks.